Right Touch Studios (RTS) is a professional full-service recording studio that produces vocal and radio demos along with music videos for new and existing artists. We create, edit and master music from all genres including pop, rock, jazz, country, hip-hop, and more. RTS has worked with many contestants and finalists of American Idol, The Voice, America's Got Talent, and Night at the Apollo. Many of the area's top artists, local dance teams, and large production shows have recorded with us. In addition, we are able to provide services for forensic audio, create custom music for radio commercials and produce iTunes and YouTube recordings. Our goal is to provide clients with an exceptional product. We strive to uniquely present your talents in the music industry. Contact us whether you are looking to write a song, record a demo, edit music, film a video, or professionally produce a CD. 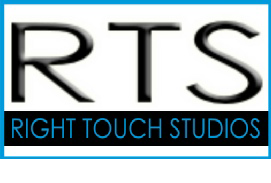 Right Touch Studios is looking forward to working with you. Call today to book your session.